That miniature cheesecake pan I have has begun to taunt me from my kitchen. Reminding me that my previous reasons for not making cheesecake, namely my drive to avoid having an entire huge cheesecake in my fridge, is now void. 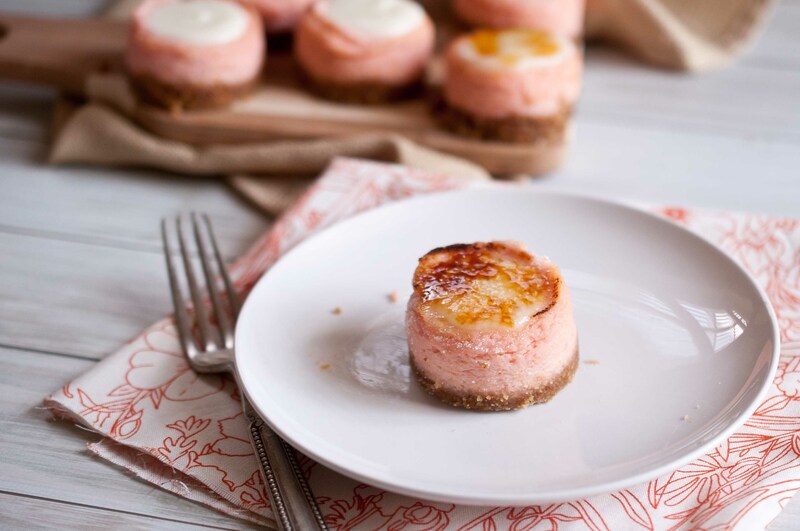 Small, adorable cheesecakes and the ability to “test” a recipe without having to deal with an entire HUGE cheesecake. And I had an unsightly amount of homemade ricotta after deciding that I should not just make one batch, but I really needed to make two because it was so much better than anything I have ever bought in the grocery store. All willpower was lost once I remembered the blood oranges I had. And then I began to wonder how that delicious sour cream topping, that you are sometimes lucky enough to find on top of a cheesecake, would taste if you made it with ricotta. Then I decided that it needed the crunch of a bruleed sugar crust on top. I really just don’t know when to stop. 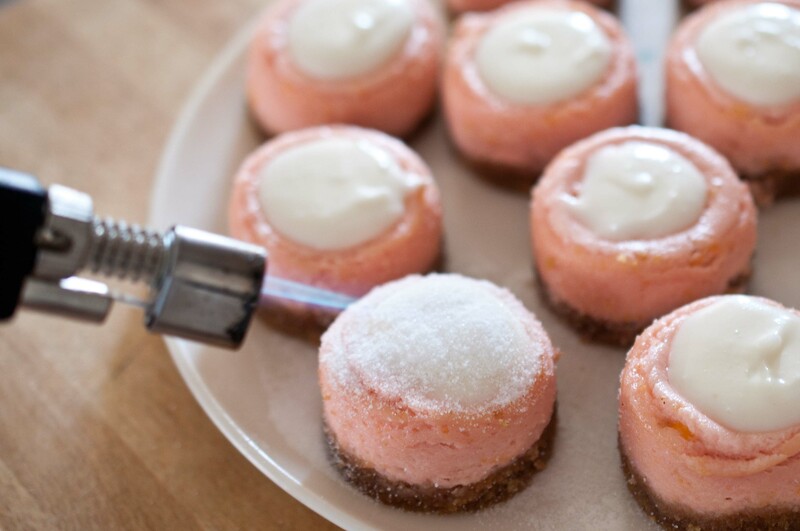 I used the Chicago Metallics Miniature Cheesecake pan, and this recipe made 12. You can also use a standard muffin tin lined with cupcake papers, this recipe will make about 6. If you want to make a standard sized cheesecake in a spring-form pan, I would suggest that you triple the recipe. In a food processor, add the graham crackers and brown sugar, process until nothing is left but crumbs. Add the butter and process until it resembles wet sand, adding more butter or graham crackers if necessary to achieve the right consistency. Place metal disks into place in the bottom of each slot. Spray with butter flavored cooking spray. Place about 1 tbs of crust into the bottom each Cheesecake slot. Press very well into place until compacted. Place the cream cheese and ricotta in the bowl of a stand mixer and beat on high until well combined. Add 1/2 cup granulated sugar beat on high until creamed. Add the egg, orange juice, and zest and beat until well combined, scraping the bottom of the bowl to make sure all ingredients are well combined. Spoon the batter on top of the crust, filling the cheesecake slots until 3/4 of the way full. Allow to cool for 20 minutes before attempting to remove from pan. Once cool, press upward in the hole on the bottom of the pan. Disk should remove easily. 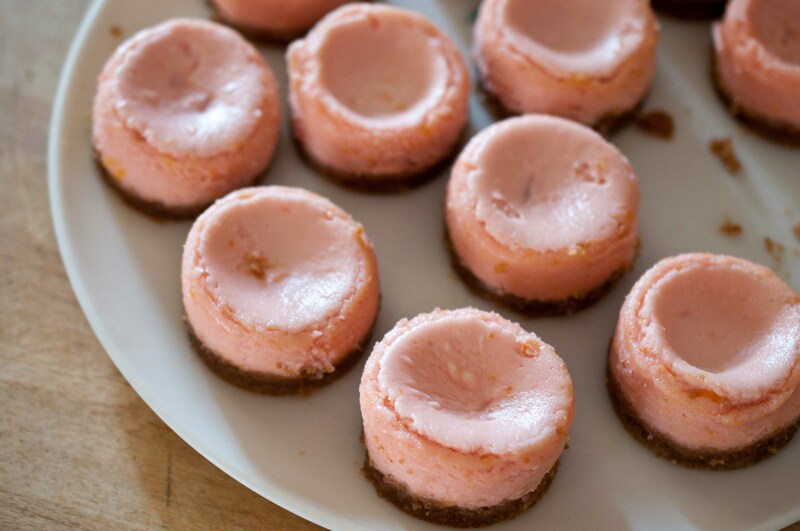 Once the cheesecakes cool, they will sink in the center, this is normal. In a small bowl, mix the ricotta, powdered sugar and vanilla until well combined. 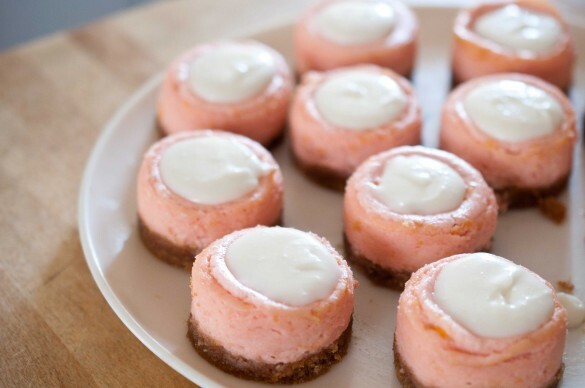 Top each cheesecake with enough ricotta mixture to fill to hole in the center until level. Chill until ready to serve, at least on hour. 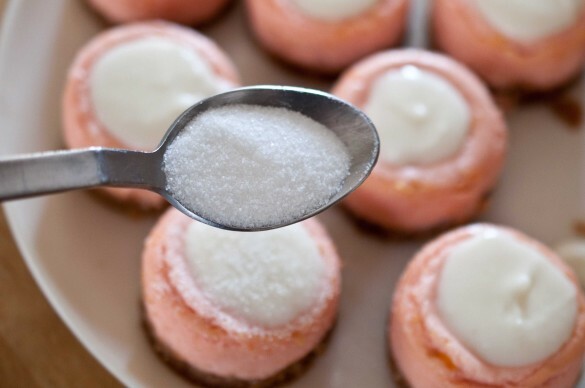 Just prior to serving, sprinkle an even layer of granulated sugar over each cheesecake. Slowly pass a kitchen torch over the sugar until it melts into a liquid and becomes a golden brown. Be careful, sugar burns are super nasty and hurt like a mother. Don’t brulee the sugar until just prior to serving, the sugar will start to turn to liquid after about an hour. 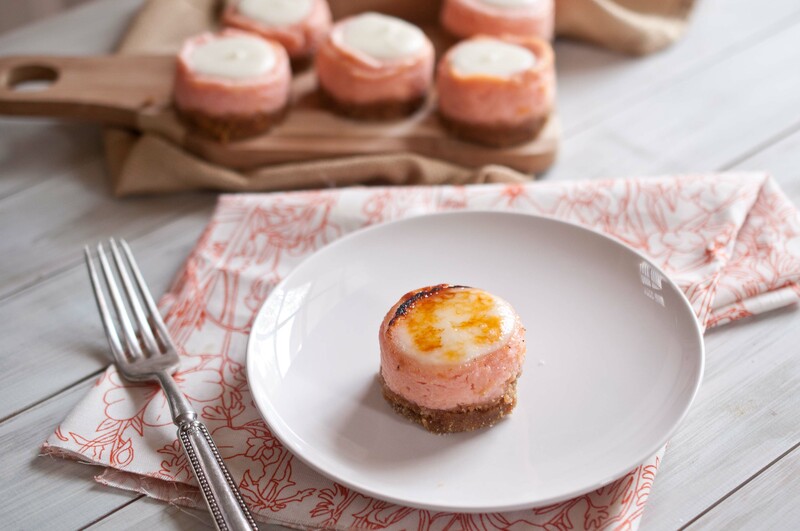 I have never made cheesecake with both cream cheese and ricotta, definitely worth a try. Your minis here do look amazing! Blood oranges are the in fruit these days and it is hard to keep from eating them instead of saving them for a dessert ingredient. Delicious post! Thanks Tina! Blood oranges are so pretty, I’m in love with them right now. 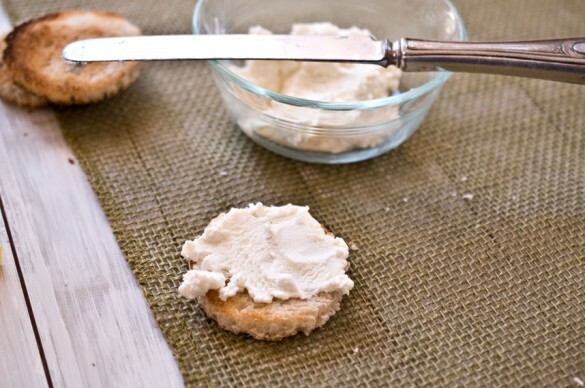 I don’t like cream cheese, but I find these little bites darling! These are amazing, Jackie! I love the bruleed tops! You had me at brûléed orange! Those cheesecakes are just so cute! I can see why you couldn’t resist making them. What a wonderful combination! These are so dainty and adorable. Perfect for a gathering of gals. Though, I’m sure we’d each need at least four apiece. Who can resist? Oh, no….I now need this pan!!! And I love that you bruleed the tops…so, so yummy!!!! Aw dangit! Now I need to buy a kitchen torch! You are pure evil Jackie. These are sinful. Sinfully delicious! These look awesome! So creamy and pretty, and small! Now that’s dangerous territory since I could eat a dozen of these without flinching. I wish more people would write blogs like this that are actually fun to read. With all the garbage floating around on the web, it is refreshing to read a blog like yours instead. I love to make cheesecake, but this is a combination I’ve never thought of. Looks so delicious I had to “stumble” it!